The Treasury Department’s Office of Foreign Asset Control (OFAC) has promised to issue guidance on effective sanctions compliance programs. This is a long-anticipated update to prior information OFAC has released on the same subject. OFAC has raised the stakes for sanctions enforcement, especially with respect to Iran and Venezuela sanctions programs. So far this year, OFAC has announced a number of significant enforcement actions and is sending a strong message on the importance of compliance. Companies that ignore these stakes are only asking for trouble (how is that for a trite phrase). OFAC’s Settlement Agreement (here) with Standard Chartered Bank contains some important details surrounding sanctions compliance. DOJ’s amended deferred prosecution agreement incorporates these details be reference (here). The SCB DPA also includes some important factors credited by DOJ as part of SCB’s remedial measures. Companies that are in the process of implementing or updating their OFAC sanctions compliance program should review these documents and should incorporate these compliance expectations and elements into their own analysis. Under Management Commitment, SCB has to ensure that senior management reviews and approves SCB’s sanctions compliance program; and senior management executives and board of directors maintain commitment and support of SCB’s sanctions compliance program. Senior managers also are required to delegate sufficient authority and autonomy to deploy its policies and procedures to mitigate SCBS’ sanctions risks; and compliance units(s) must receive adequate resources, including in the form of human capital, expertise, information technology and other resources, as appropriate, that are relative to SCB’s breadth of operations, target and secondary markets, and other factors affecting to its overall risk profile. Senior management has to promote a “culture of compliance” throughout the organization; and demonstrate recognition of the seriousness of apparent violations of the laws and regulations and the importance of preventing recurrence. Under Risk Assessment, SCB has to conduct an OFAC risk assessment in a manner and with a frequency that adequately accounts for potential risks posed by its clients and customers, products, services, supply chain, intermediaries, counter-parties, transactions, and geographic locations; and SCB has to develop a methodology to identify, analyze, and address the particular risks it identifies. With respect to Internal Controls, SCH has to design and implement written policies and procedures outlining its sanctions compliance program. These policies and procedures have to be relevant to the organization, captures SCB’s day-to-day operations and procedures, are easy to follow, and prevent employees from engaging in misconduct. Further, SCB’s internal controls have to adequately address the results of its OFAC risk assessment and profile, and should enable SCB to clearly and effectively identify, interdict, escalate, and report to appropriate personnel within the organization transactions and activity that may be prohibited by OFAC. Interestingly, with respect to automated databases used for sanctions compliance, SCB has to ensure that it has selected and calibrated the solution in a manner that is appropriate to address SCB’s risk profile and compliance needs, and SCB routinely tests the solution to ensure effectiveness. SCB has to enforce its policies and procedures through internal and/or external audits and has to ensure that its OFAC-related recordkeeping policies and procedures adequately account for its requirements. SCB specifically has to ensure that, upon learning of a weakness in its internal controls pertaining to sanctions compliance, it will take immediate and effective action, to the extent possible, to identify and implement compensating controls until the root cause of the weakness can be determined and remediated. SCB further has to clearly communicate the sanctions compliance program’s policies and procedures to all relevant staff, including personnel within the sanctions compliance function, as well as relevant gatekeepers and business units operating in high-risk areas (e.g., customer acquisition, payments, sales, etc.) and to external parties performing sanctions compliance responsibilities on behalf of SCB. In particular, SCB has to appoint personnel to integrate the sanctions compliance program’s policies and procedures into SCB’s daily operations. This process includes consultations with relevant business units and ensures that SCB employees understand the policies and procedures. With respect to Testing and Audits, SCB has to ensure that the testing and/or audit function is accountable to senior management, is independent of the audited activities and functions, and has sufficient authority, skills, expertise, and resources within the organization. SCB has to employ testing or audit procedures appropriate to the level and sophistication of its sanctions compliance program and ensure that this function, whether deployed internally or by an external party, reflects a comprehensive and objective assessment of SCB’s OFAC-related risks and internal controls. Further, SCB has to ensure that, upon learning of a confirmed negative testing or audit result pertaining to its sanctions compliance program, it will take immediate and effective action to identify and implement compensating controls until the root cause of the weakness can be determined and remediated. Finally, with respect to Training, SCB has to ensure that its OFAC-related training program provides adequate information and instruction to employees and, as appropriate, stakeholders (for example, clients, suppliers, business partners, and counterparties) in order to support SCB’s sanctions compliance efforts. SCB’s training program has to provide OFAC-related training with a scope that is appropriate for the products and services it offers; the customers, clients, and partner relationships it maintains; and the geographic regions in which it operates. SCB has to conduct training for all relevant employees at least once a year. SCBs training resources and materials have to be available to all personnel and easily accessible. Upon learning of a confirmed negative testing result or audit finding, or other deficiency pertaining to its sanctions compliance program, SCB has to take immediate and effective action to provide training to relevant personnel. The post OFAC Sanctions Compliance Insights from Standard Chartered Bank Enforcement Action (Part III of III) appeared first on Corruption, Crime & Compliance. Executive coach and strategic advisor Amii Barnard-Bahn provides guidance on how executives can prepare for a board appointment: Start by following the 10 steps outlined here. The post Are You a Board-Ready Executive? Take These 10 Steps First appeared first on Corporate Compliance Insights. According to new research from cybersecurity company Symantec, 67% of hotel websites are leaking customer reservation details and other personal information. Candid Wueest, the company’s principal threat researcher, tested more than 1,500 hotels in 54 countries, including low-cost to high-cost hotels, as well as both chain and independent hotels. When a customer uses a hotel’s website to book a room, the site usually creates and sends them a link so that the customer can directly access and manage their reservation. According to Symantec, part of the problem is that third-party advertisers on hotels’ booking websites and web analytics companies (which track web traffic) can access customers’ bookings because they also get those links. This means that advertisers and analytic companies – including any potential malicious actors among their employees – could access and steal the information that the customer entered when booking a room, and even change or cancel the reservation. Symantec also found that more than a quarter of the hotel websites examined do not send secure, encrypted links in their confirmation emails. Encrypted links prevent anyone trying to hijack a customer’s data from being able to see that data. If a customer received a confirmation email while using an unprotected WiFi (a public network in a café or an airport, for example), a cybercriminal could intercept that customer’s emails and use the unencrypted hotel booking link to access the customer’s booking. Some of these automatically generated links also contain details like customers’ email addresses in the web address, which makes accessing their information even easier for cybercriminals. Additionally, many hotel websites are vulnerable to a type of cyberattack called “brute forcing,” where an attacker can use the customer’s email address and guess their booking number to gain access to the reservation and personal information. In some cases, Symantec found that hotel websites did not even require an email address to access customers’ reservation information via brute forcing. Though this method would not be useful to gain access to large amounts of customer data, attackers could use it to target individuals, like a specific CEO or conference attendee. Wueest noted that hotels have thus far been slow to respond to these data exposure risks, and some have not responded at all. When he alerted the hotels’ data privacy officers to the problems in their sites, 75% responded, and those who did took an average of 10 days. Hotels and their information security staff should promptly assess their booking processes to ensure they are minimizing the risk of potential data leaks and breaches. By leaving these gaps in their websites’ security, they are endangering their customers and opening themselves up to risk, including potential liabilities and reputational damage. Symantec recommends that hotels use encrypted links, and ensure that the automatic links generated do not include information like customers’ email addresses. It also recommends that customers use Virtual Private Networks (VPNs, services that protects users’ internet traffic) when booking or accessing their reservations using public WiFi to prevent any cyberattacker from intercepting any information that would provide a way in. The report should also serve as a reminder that corporate employees’ personal devices and personal information are popular targets for cybercriminals and can be especially vulnerable to risks while traveling. Any time an employee exposes their devices to unprotected networks or, in this case, insufficiently protected websites, it leaves both the employee and their employer at risk. Even if an employee is using their own device to conduct business, it still endangers their employer because it may expose valuable business information. Cybercriminals have particularly used the hospitality industry as a hunting ground for such attacks, for example, targeting individuals using hotel WiFi, tricking them into downloading malicious software and stealing their information or spying on their internet activity. What can this epic teach us about success and failure in a data governance strategy? Turns out, quite a lot. Adlib Software’s Fahad Muhammad outlines five principles from Game of Thrones that can inform your approach. The post 5 Lessons in Data Governance from Game of Thrones appeared first on Corporate Compliance Insights. States and local communities are passing pay equity laws that ban questions about a candidate’s salary history. Is your organization in compliance? The post How to Bolster Your Hiring Practices as More Pay Equity Laws Come Online appeared first on Corporate Compliance Insights. Given the international community’s ambivalent attitude toward the so-called Belt and Road Initiative, the world will be closely watching the second BRI Forum, which is due to be held April 26-27 in Beijing. Two years after the first BRI summit, which was greeted with enthusiasm by the developing world, things have changed rather quickly. Since President Xi Jingping announced the Belt and Road Initiative in late 2013, shortly after his arrival to power, China has invested some $300 billion in it, mainly in connectivity among neighboring countries. While the project is only five years old, President Xi Jingping’s grand plan for China’s global expansion has elicited strong reactions from the rest of the world, both from countries that will benefit from the BRI as well as other major players, such as the United States and the European Union. Over the five years since its announcement, the BRI has evolved in terms of its objectives: from its initial economic focus related to trade connectivity—and a way for China to export its excess capacity—to much more of a soft-power tool. A large number of the BRI’s infrastructure projects now appear to be strategic rather than economic in nature. This change in tone is driving the increasingly negative view of BRI in the West with the EU expressing concerns about China’s strategic ambition at the annual EU-China summit earlier this month. Nonetheless, this has not stopped Italy from becoming the first G7 country to formally join the BRI. There has also been backlash in the developing world where recipients of BRI’s infrastructure projects are having to borrow aggressively to be able to finance them. 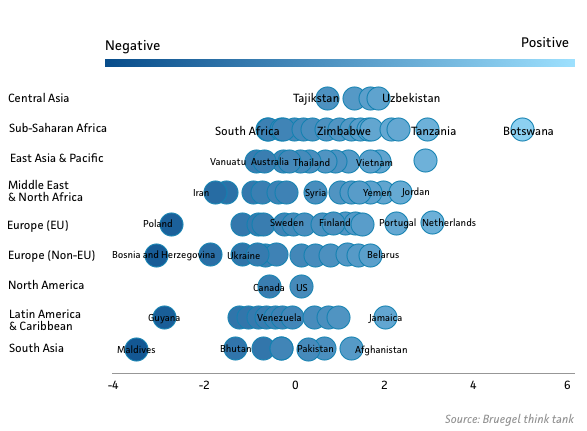 A recent analysis that we conducted confirmed that sentiment toward the Belt and Road has indeed worsened in many countries. Our report, which drew data from the Global Database of Events, Language, Tone (GDELT) that covers broadcast, online and printed news from 132 countries in over 100 languages, shows a sharp move away from an averagely positive image before 2018 to a negative one thereafter. The only exceptions are the Middle East and North Africa. The worsening image of BRI is a wake-up call for China as it seeks to increase its soft power globally. Our analysis offers some insights into the reasons for the worsening image of BRI. The first and foremost is trade. Countries appear increasingly wary of excessive dependence on Chinese imports and an imbalanced trade pattern. In addition, the difficult debt dynamics in recipient countries are an issue. More generally, China may have been piling up too many objectives under the guise of the BRI, some of which could be inconsistent with one another as it tries to replicate its internal way of doing business in overseas markets: using China’s resources and materials with a clear flavor of state capitalism. While keeping state-owned companies busy with BRI projects may be appealing from an economic perspective, it only exacerbates foreign concerns, weakening China’s international image. Most of the recipient countries welcome infrastructure financing from China, but also expect transparency and fair competition. The latter is at odds with China’s existing strategy. The fact that the BRI’s image is suffering is also demonstrated by the announcement of alternative proposals from both the U.S., through its Indo-Pacific strategy with Australia, India and Japan, and the EU with its EU-Asia connectivity plan. Some argue that the BRI may have been the tipping point for the U.S. administration to move from engagement to containing China, which has contributed to the current trade war between the two. While painful, this is not a complete negative for China, as it is clearly learning how difficult it is to acquire soft power, no matter a country’s economic size. In fact, such a backlash offers China an opportunity to explore a more sustainable strategy. China is realizing that a confrontation with the U.S. may not be a winning strategy, no matter the economic benefits. Given the diminishing returns on investment at home, China needs to expand in overseas markets, but it should not do so by excluding other investors from benefiting from such projects. Against this backdrop, the next path for China’s Belt and Road needs to be a more flexible and open route to building its soft-power image. The worsening image of the Belt and Road is definitely a wake-up call for China in its pursuit of increasing its soft power globally. To that end, China has recently made a number of strategic changes regarding the BRI, which have largely remained unnoticed, given the lower-key approach. First, China has sharply increased the number of countries signing MOUs from the original 63 to 150. The key is to make the Belt and Road less targeted, so as to limit the West’s geopolitical concerns about this project. Secondly, China is trying to use a more multilateral framework to push the BRI, and especially the Asian Infrastructure Investment Bank. Such a multilateral framework retains Chinese characteristics, thereby allowing China to keep the ultimate control of key projects, but it also offers room for other developed countries to get involved, especially Europe and South Korea. China may be willing to make some compromises in the way it shares the benefits of the BRI, but multilateralizing the strategy does not equate to a full retreat to the Western model. 73 percent of high-performing risk programs that have risk management represented in executive management meetings (most or all the time) are more likely to exceed performance goals and achieve higher growth according to a new risk management survey by Deloitte. A recent meeting of a WHO Emergency Committee convened to consider the Ebola outbreak in the Democratic Republic of the Congo has concluded that there is an increasing risk of spread to adjoining countries. The catastrophe loss experience of the last two years is a wake-up call for the insurance industry, highlighting a trend of growing devastation wreaked by so-called 'secondary perils' – which are independent small to mid-sized events, or secondary effects of a primary disaster. The post Standard Chartered Bank’s Continuing Culture Challenges and Sanctions Compliance (Part II of III) appeared first on Corruption, Crime & Compliance. The post Kellogg 2019 Proxy Vote Recommendations appeared first on Corporate Governance. Of course, the directive is not perfect. But once it is implemented, it will introduce sanctions for people attempting to retaliate against whistleblowers, and it will exempt whistleblowers from civil or criminal liability relating to the disclosure of information which is in the public interest. Four years after an EU commission staffer said that there was neither the legal basis nor the political will to institute an EU-wide directive on whistleblower protection, coordinated action from civil society and a groundswell of support from European citizens had led to just that. Their perseverance not only demonstrates the value and importance of civil society; it should be an inspiration to those fighting hard for the rights of whistleblowers, as well as to all those who believe that the European Union can be an agent of positive change. In a letter to National Whistleblower Center chair Stephen M. Kohn, Georgia Georgiadou, deputy head of the EU’s Fundamental Rights Policy program, wrote that the rules will strengthen enforcement of EU laws and policies regulating a range of areas including food and product safety, environmental protection and corporate taxation. Instead, I decided to tackle teaching the course in a manner that I hoped would allow students to think through the different roles they might play within compliance efforts, followed by a few classes dedicated to specific compliance areas in an attempt to allow students to better understand how their role might look in practice. To do so, I draw on enforcement, compliance, behavioural ethics, and professional responsibility materials. Each class session has one dedicated case study to help students understand the concept being presented. In Corporate Compliance & Ethics, I begin the first module of the course by providing students a foundation in what compliance is and where it comes from. At the same time, I introduce them to (i) behavioural ethics literature and (ii) the way the Rules of Professional Conduct do and do not apply to a practice focused in compliance. I then turn to the importance of self-policing and internal enforcement within firms using Enron as the case study. In the second module, I focus on different compliance actors. This is the meat of the course. It allows students to understand the different ways they might interact with or participate in compliance efforts. We begin by studying the role of regulators, prosecutors, and courts. We then spend a class session on each of the following: gatekeepers, whistleblowers, investigators, remediators (e.g., monitors), and private enforcers. In this part of the course, we have covered case studies that include Wells Fargo, Deflategate, the General Motors ignition switch scandal, and Penn State. This method of teaching, which is admittedly more akin to many business school courses, allows students to apply the underlying concepts to real world examples. In particular, it allows them to think through what they, as lawyers, would be responsible for in each situation. In the third module of the course, we have traditionally focused on the FCPA, antitrust, the False Claims Act, and Title IX. In this module I try to provide them with a variety of enforcement and regulatory sources of “law,” so they get a sense of the grey areas (e.g., Dear Colleague Letters) from which compliance requirements emerge. Additionally, they are able to take the concepts from the first two modules and then apply them to these specific compliance areas that can have quite different risk and monitoring challenges. I have, of course, picked rather extreme examples as case studies (e.g., Siemens; Baylor), but they present students with the stark realities of what can happen when compliance programs fail and allow them to think through how they might have avoided or prevented similar compliance failures from occurring. In the fourth module of the course, the one that has changed the most over the years, I attempt to merge theory and practice. Most recently, we have focused on conflicts of interest and sanctions for compliance officers, but in the past I have covered the rise of global compliance programs and assigned actual compliance policies and documents. This course has been successful and rewarding. Students like it. I feel as if they learn information they might not have otherwise been exposed to in law school. And I’ve even had some students follow-up with me after the fact to express how the course helped them in various summer employment opportunities. Veronica Root Martinez is an Associate Professor of Law at Notre Dame Law School. Her scholarship is available here. The Loss Prevention Foundation (LPF) recently announced that its Swing for Certification golf tournament is less than sixty days away, and there are only a few spots left for golfers.